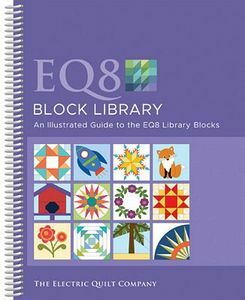 The EQ8 Block Library book offers an escape from the computer to a world of inspiration. Flip through the pages, earmark favorite blocks, then use the guide to find the blocks in the EQ8 quilt design software. This is a fun, uncomplicated book for any EQ8 user. In your busy lifestyle, you probably don’t have the time to sit at the computer and take a long look at every block in the EQ8 Library. This book offers an escape from the computer to a world of inspiration. So between meetings, soccer games or whatever fills your life, flip through the pages of this visually appealing book and simply enjoy the view, or use it to plan the blocks you’ll use in your next quilt. All 6,700+ blocks are organized by category and style, just as they appear in EQ8. Each is named, illustrated and indexed. Use this book to find the blocks you want to use for your next EQ8 project. It’s so easy to use the Block Library Search tools to quickly find the blocks in EQ8. There are up to 42 color blocks per 8.5 x 11 inch page, 216 total pages. Plus it has the popular spiral binding so pages can rotate 360 degrees and lay flat. This book makes a wonderful gift. The 6,000 plus blocks are well organized into categories based on style such as Eight-Pointed Stars, Dresden Plate, Four Patch, Nine Patch, Orange Peels, and Pictures. Other category types include border blocks, sashing blocks and quilting stencils. Softcover, Spiral Bound, 208 pages. Companion item: EQ8LESSON, EQ8 Lessons for Beginners. The EQ8 Block Library includes traditional as well as contemporary blocks, including pieced, applique and foundation friendly. It even includes combination blocks with a pieced background and overlay applique. Blocks are well organized into categories based on style like Eight-Pointed Stars, Dresden Plate, Four Patch, Nine Patch, Orange Peels, and Pictures. Other category types include border blocks, sashing blocks and quilting stencils.